Costumes from the Robert De Niro collection are on display at the Victoria and Albert Museum in London. ©V&A images. The rich history of costume design and its most visionary personalities takes center stage in Hollywood Costume, the latest exhibition at the Victoria and Albert Museum (V&A) in London, which opened October 20. Some of Hollywood’s most iconic characters are the focus of the exhibition, which spans a century of film history. Seven costumes featured in the exhibition are on loan from the Harry Ransom Center. Costumes are significant to a film production because they allow an actor to inhabit the character. In the words of Martin Scorsese, “The costume of the character is the character—the tie a man wears can tell you more about him than his dialogue.” Four of the Center’s costumes on loan to the V&A are from Scorsese films, specifically Raging Bull (1980), Casino (1995), The King of Comedy (1983), and Taxi Driver (1976). 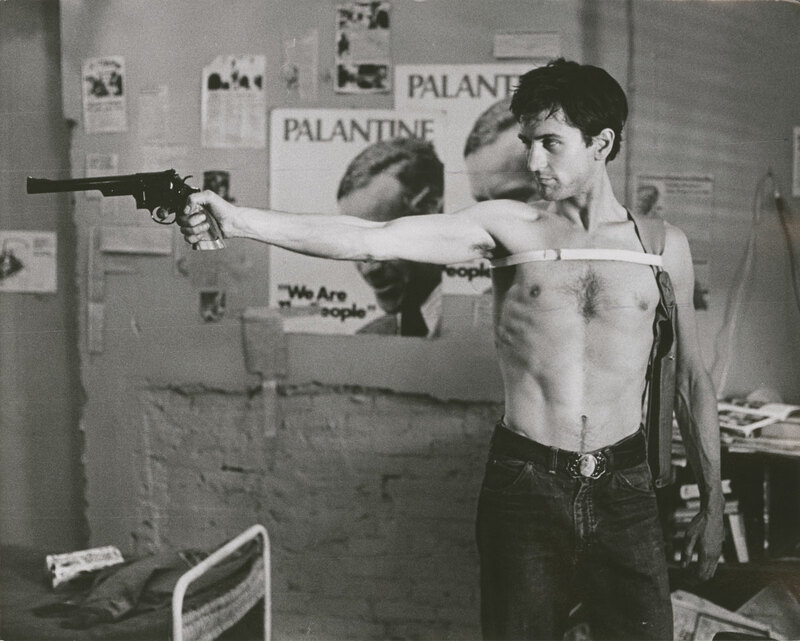 For Robert De Niro, donning the costume was part of the transformation process necessary to fulfilling his role in Taxi Driver. Ruth Morley, costume designer for the film, said, “When I finally found the plaid shirt Bobby wanted to wear, when I found the army jacket, the pants, well he wanted to wear them.” That army jacket and plaid shirt, part of the Ransom Center’s Paul Schrader collection, is on display at the exhibition. A fifth costume worn by De Niro, from Frankenstein (1995), is also featured. Hollywood Costume is made up entirely of loaned objects, which made the curators’ job of featuring the “most enduring cinema costumes from 1912 to the present day” especially challenging. Historically, there has been a significant lack of documentation regarding Hollywood costumes, which compounds the difficulty of research in the field of costume design. Following the decline of the Hollywood studio system after its peak in the 1930s, 1940s, and 1950s, many props, costumes, and related ephemera were sold off in public auctions. Not surprisingly, many of the more than 100 costumes displayed are on loan from passionate private collectors. Two costumes from Gone With The Wind, part of the Ransom Center’s David O. Selznick collection, also feature prominently in the V&A exhibition. The green curtain dress and the burgundy ball gown, both worn by Scarlett O’Hara (Vivien Leigh), are particularly fragile and required special care, including customized textile boxes that would mitigate any movement or abrasion that might be caused by motion in transit. Jill Morena, the Center’s Assistant Curator for Costumes and Personal Effects, couriered the costumes and oversaw their installation at the V&A. Cara Varnell, an independent costume conservator who performed conservation work on the dresses, also assisted with the installation. 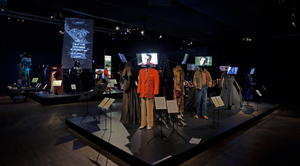 The exhibition offers a chance to explore what V&A Assistant Curator Keith Lodwick calls the “often misunderstood role of the costume designer.” That role, ever adapting to changes in the industry, is powerful enough to influence culture and memory far beyond the scope of a 90-minute film. Ultimately, the costume designer can develop a character into a cinematic icon.